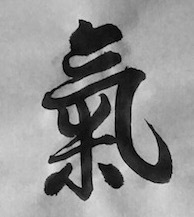 Qi (modernized Chinese: 气, traditional Chinese: 氣, pinyin: qì, Wade-Giles Ch’i, pronunciation (soundfile)) is the Chinese term for (life) energy, which is part of everything. It is present in the “10.000 things” as well as in living beings, in which it is associated with breath and bodily functions. As a traditional notion reshaped by Daoist thought, Qi is believed both to be able to create and to destroy and is thus the central conception to underpin the teaching of healing and fighting, i.e. of Traditional Chinese Medicine, Qigong and Chinese (internal) martial arts. 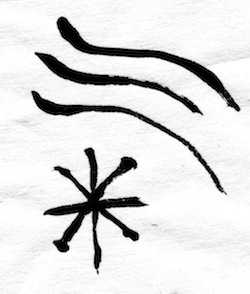 The old character for “Qi” was like the character for “air”, capturing the flowing nature of Qi and its pervasiveness. 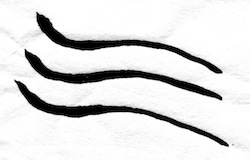 Later, the character evolved into a new one: the character for “rice” can now be found in its middle. One can picture steaming rice as a symbol for the energy provided to the body by food, while the structure of the character itself reminds of the eight cardinal directions, in which the Qi is flowing. Thus, Qi literally translates as “air”, “gas” or “breath” and figuratively as “life energy” or “life force”. Qi is a philosophical notion as well as a practical conceptual model – a thought concept. Despite its cognitive interest to describe the patterns of life, which suggests a connection to the sciences of biology or medicine, it is much closer related to the philosophical approach of the humanities as to natural scientific theory. Its aim is to grasp the biological conception of the human body, but also of plants and animals as living organisms. The notion Qi captures the life process: the resources of moving and acting (martial arts) resp. hyper- and hypofunction (Traditional Chinese Medicine). Thus connected/tied to the body and the corporeal system, it can neither be reduced to an abstract floating energy nor be described as material energy with a (however subtle) body of its own. The existing expressions of nei qi (internal, personal Qi) and wei qi (external Qi) situates the body into an environment, to which it is connected, e.g. by the breathing process. Despite not being visible, Qi is not mystical. A simple example: If one closes one’s eyes and holds one’s palms close to the eyes without touching them, one can feel the hands radiate warmth – or in some cases coldness. This would already be a manifestation of Qi. The thought concept of Qi is not endemic in Chinese culture; it is comparable to the Hindu concept of “Prana”, the Japanese “Ki” and the Tibetan “Lung”. Traditional Chinese Medicine describes illness as a state of dysbalance of Qi in different areas of the organism. Qigong – the cultivation of life energy, which includes breathing exercises as well as moving exercises and may also contain nutritional elements – is regarded as a way of enhancing health and overall life quality by actively balancing the Qi. Qigong is one of the five pillars of Traditional Chinese Medicine. In addition to practicing Qigong as a preventive method, you can find the practice of fa qi, which works by a therapist transmitting Qi – usually as thermal energy, i.e. by touching and/or massage techniques. These Qigong techniques are rather related to Tuina (Chinese Massage) than to mysterious powers of energy manipulation by an enlightened master. The concept of the three treasures (san bao) – Jing, Qi, and Shen – provides the context for Qi as it is seen by Traditional Chinese Medicine. In it, Qi – the life force, the energy of the bodily matter as influenced by thoughts and emotions – is linked to Jing – the sexual, i.e. sperm/ovary energy, the essence of the physical body – and Shen – the generative power of the spirit, the consciousness. If one adds xue (blood) and the other bodily fluids, the five main substances of the body according the Traditional Chinese Medicine are complete. Many Asian (internal) martial arts, e.g. the Chinese Taijiquan and the Japanese Aikido, but also shaolin gongfu, refer to Qi. The notion of Qi is widely used as a didactic concept, with the help of which the student is directed towards the correct execution of the movement or the right focus by telling him or her where to lead the Qi. Some aspects of Qi can also be explained by biomechanics or body physics and are therefore – especially for non-Asian students – rather a sign of respect towards the original cultural tradition than a necessity. Other aspects of Qi go beyond natural science in the sense that they cannot be adequately expressed in its constraints. One example is the didactic requirement to talk about the body status of the advanced practitioner, which is always a combination of body (loosening muscles, sinews, etc.) and mind (focus, intention, overall mental state). Only the right status allows using flexible, soft power (Qi) instead of the more rigid muscle power (Li) to execute a punch or a throw. Another example is the difference between breathing and breath: a fighter can be out of breath, i.e. he is unable a fight back against his opponent, but still breathing. Here, Qi is used in the sense of air/gas/breath: the fighter is run out of energy. In the theory of Taijiquan, Qi refers to internal intrinsic energy. Qi is required for mental and physical activity: without it one cannot talk, walk or think; life would be reduced a mere vegetative state, a coma or a living death. The existence of internal energy itself is first of all a consequence of bio-chemical reactions in the body. The resulting internal energy can pressurize our body to sit or stand up, but this energy conversion can also be used to create compression in the body, which is able to generate high speed for powerful punches and kicks. While the body can be trained to build up and sustain compression, bare Qi without an adequate oxygen supply and the power of mind is useless as can be illustrated by the body status when sleeping. Qi in martial arts only works when linked to mental awareness and physical fitness. There are different philosophical interpretations of Qi. The Daoist narrative of the origin of the world begins with the existence of yuan qi (original Qi), in which Yin and Yang were mixed. As a consequence of their separation, heaven and earth were formed: yang qi went up and led to the growth of a bright and clear sky, while yin qi sank down and built the dark and heavy ground. Man received both Yin and Yang and is therefore portrayed as a connection between sky and earth. The concept of Qi as creating power, as life energy, is rooted in Daoism. In contrast to that, Neo-Confucianism sees a conceptual dualism of Qi and Li. For Neo-Confucianists both Qi – the material life force – and Li (理) – the rational principles or the (natural) law, the sum of which is taiji – are co-dependent in creating the structures of matter and nature. The mystical, seemingly non-scientific nature of the concept of Qi as life energy has lead to diverse receptions and analogies in Western culture. In popular culture, „the force“ in Star Wars is a conception of energy, which with its two sides (light and dark) is roughly comparable to Qi with its Yin/Yang-dynamics, while it does not claim any connection. An early analogy to Qi is Wilhelm Reich’s “Orgone”, which was originally a psychoanalytical concept that was later developed into a pseudo-scientific theory of abstract floating energy that could be collected or transmitted by means of machines. In the 1970s, circles connected to the New Age movement, which were interested in mysticism and inner alchemy, developed a westernized spiritual/esoteric notion of cosmic life energy. While the description of energy as subtle, ethereal bodily structure can also be retraced to medieval alchemy, newer approaches tend to additionally claim traditional „Far East“ heritage – i.e. the concepts of Qi or Prana – to underpin their theories and to present them as being unifying and universal in nature. This „Western“ concept of material energy, which in extreme cases is even thought to react to invocation, can be seen as a reification of the notion of Qi that is incompatible with its original context in Chinese thought.